Individual security – actions that are aimed at ensuring the personal safety of a particular individual from immediate threats to life and health. The purpose of individual security is to ensure safety of the client by avoiding physical impact on a protected person, and in case of attempt to stop it immediately and with minimal loss. Support the client in his movements. Professionalism of the Bodyguard depends on the training activities and upcoming trainings. The company group provides such trainings with its own training center. Individual security is carried out by specially trained staff which include masters of sport in martial arts forms. The most savvy, cultural, decent candidates who received additional trainings. The risks and other factors. Contrary to popular belief, this service is used not only by famous people (politicians, show business and big businessmen). This type of security activity is a fairly flexible system. According to the occupation of the client’s lifestyle the qualified staff of the Civil Code «Kiev Security Group» will help to pick the individual scheme of individual security. You may need the services of individual security even if your business is only in its infancy. This is not always associated with direct threat to human life. The fact that you decided to take care of your safety and safety of your relatives, makes you as a serious, businesslike man with far-reaching plans. In addition individual security services may be provided to a group of people at once. 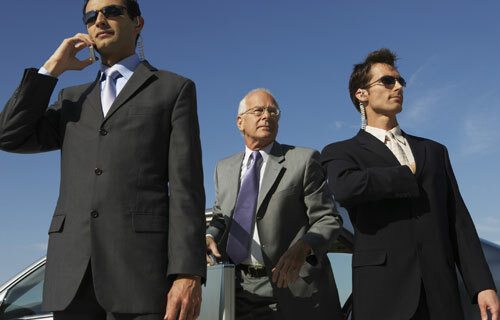 Security for staff members or groups is a task for a professional team of specialists (bodyguards). We offer several approaches to the personal security for customers. “Invisible” - bodyguard merges with the client environment and is often imperceptible as a protective agent. This style is acceptable when there is a need to limit the circle of individuals knowledgeable about the true role of your companion. Individual security services are provided on an individual algorithm and graphics, which is agreed with the client. Hourly security (during the deal, negotiations). Security through technical means (the means of detection, the search for listening devices). Bodyguard and driver in one person. Protection of family members (wife, children, relatives). To cover and evacuate, if it is impossible to avoid conflict, vigorously implement counter-measures.